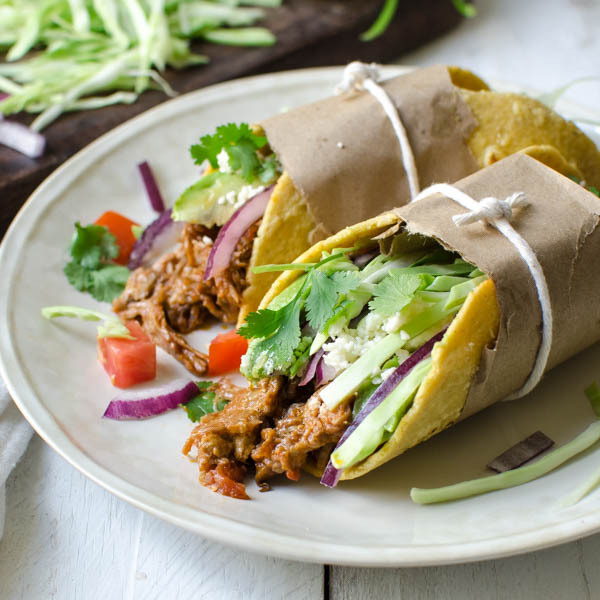 Looking for a fresh homemade taco recipe? 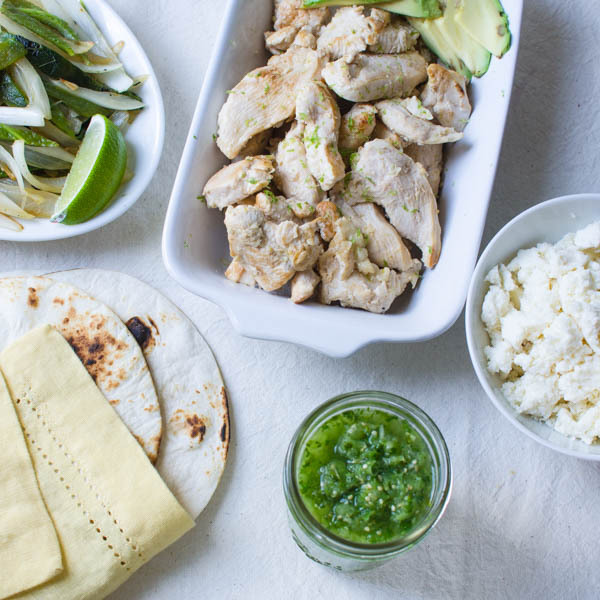 These Chicken Soft Tacos with Fresh Tomatillo Salsa are the BEST with charred poblano peppers, queso fresco and garlicky lime chicken. 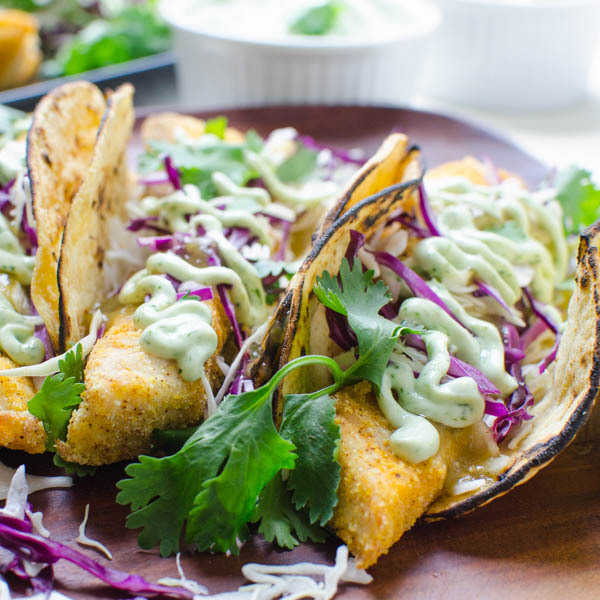 These soft chicken tacos are a winner! It had been a busy day, full of errands, laundry, cleaning and the typical harried frenzy of trying to do all the housework I’d successfully avoided doing during the workweek. Scott was busy too, trimming foliage around the yard, scooping detritus from the pool and working to catch up on his “to do” list. By 4 o’clock we were beat. We sat down to relax (Scott’s code for “watch golf”) for an hour before we started to think about our date. At 5:30, I thought we should start getting ready, but he poured me a little glass of wine (the leaders were still on the 17th) we decided to relax a little more. By 6:30, I thought I should really jump in the shower, but neither one of us had the energy or motivation to get off the couch. By 7:30 – our plans were firmly pushed to the side and we were pulling everything out of the refrigerator wondering what we could make for dinner. I had several poblano peppers, so we decided to construct a meal around them. Coincidentally, I had also just gotten Rick Bayless’ cookbook, Mexican Everyday — so I flipped to the appendix and looked under “poblano”. There were several recipes, but only one that approximated the current contents of my refrigerator: soft chicken tacos. Between the two of us, it only took about 25 minutes to make the dish. We settled down in front of the tv, wine glasses full and tacos beckoning. You know when you take a bite of something and you actually stop mid-bite realizing how good it is? You’re eyes go wide. A smile creeps across your face. And you slow your natural chewing cadence to savor what you’re eating. That was this moment! We were wowed by the flavors, the brightness and the straightforward simplicity. 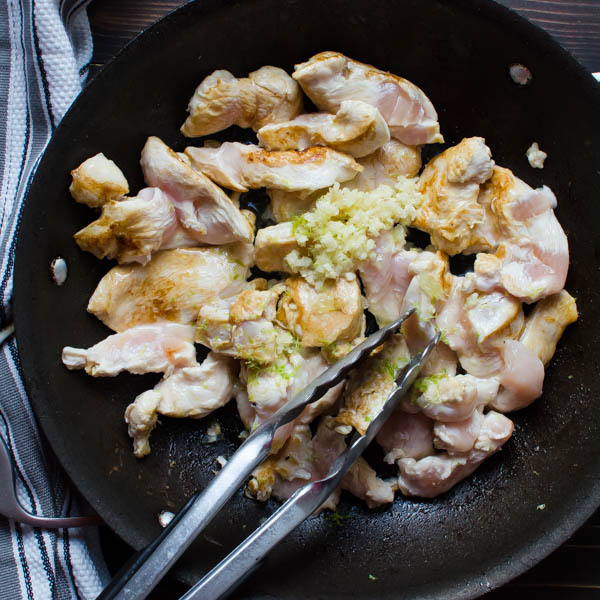 What’s special is that there’s no cumin or chili powders — just fresh lime and garlic, stirred into the chicken which creates a vibrant coating on the seared chicken that dances in your mouth. Pow! And that fresh tomatillo salsa adds a bright, fresh punch. Don’t skip it. Since that “date night” we’ve made this recipe countless times, putting our own riffs on it here and there depending on what we have on hand. It’s always a hit. You HAVE to make this. 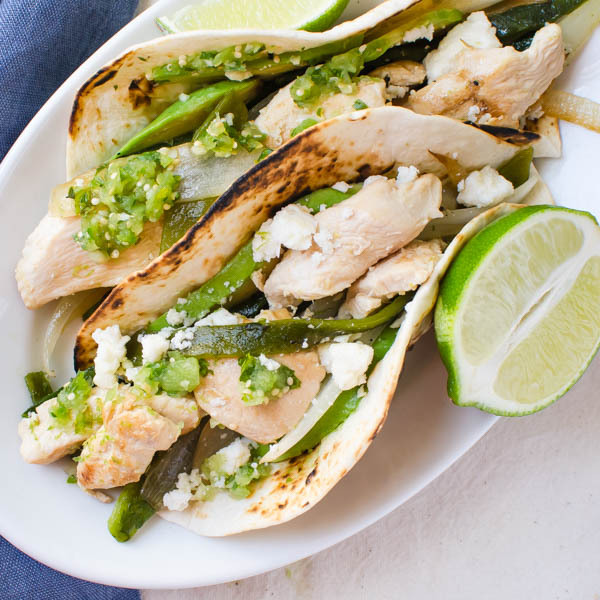 These soft tacos are fresh and light and totally addictive. 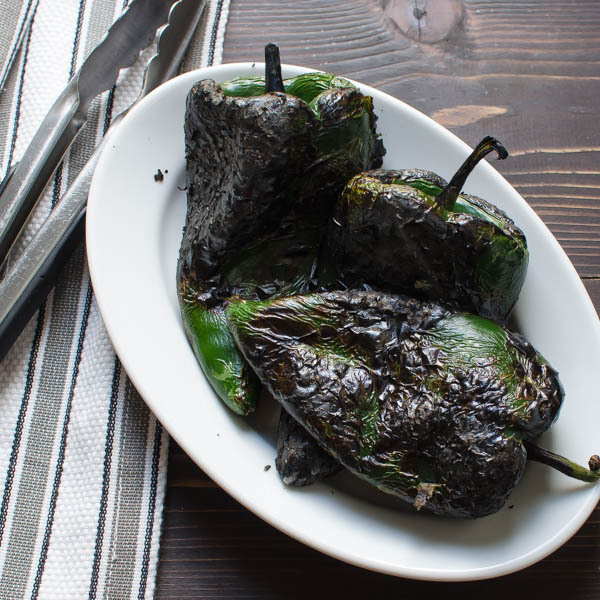 Blacken poblano peppers. If you have a gas stove or grill, place peppers directly over the gas and cook until skin is black and blistered all over. Otherwise, cook peppers in a 375 degree oven for 25 minutes, until skin is blackened and flesh is softened. Place hot peppers in a brown paper lunch back and fold the top over tightly to steam the peppers. Set aside. Heat oven to 200 degrees. Place a piece of foil over a baking sheet and spray with vegetable spray. Add oil to a medium skillet, saute onions over medium high heat until crisp tender. Transfer to the prepared baking sheet. 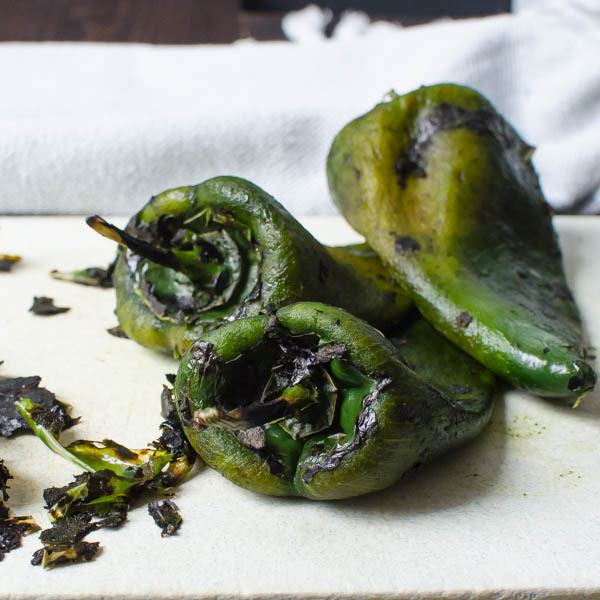 Remove poblanos from paper bag and rub the blackened skins from the flesh. Remove the stem and seeds and slice into long strips about 1/4" wide. 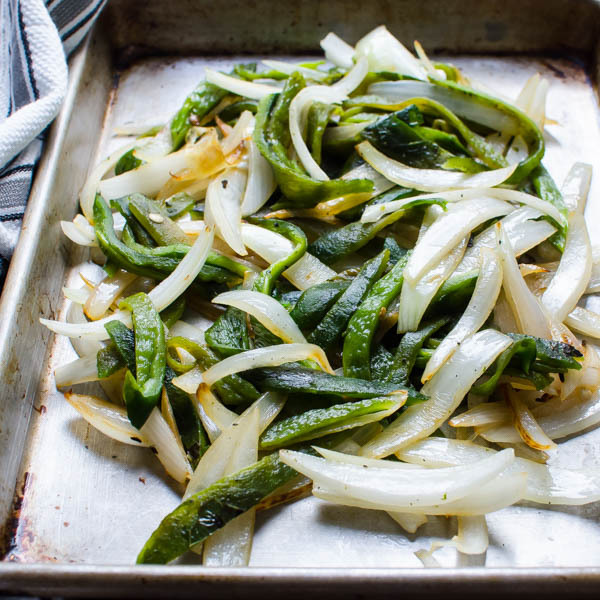 Add poblanos to onions and place in oven to keep warm. Heat remaining two tablespoons olive oil in the skillet over medium high heat. Add chicken and let cook for 2 minutes or so without stirring, until one side of the chicken releases from the pan. Flip chicken pieces to opposite side to brown 1-2 minutes. Add garlic, lime zest and juice. Stir to coat chicken in garlic and lime. If needed, add salt and pepper to taste. Warm flour tortillas in oven by wrapping them in aluminum foil, or if you prefer a little char on your tortillas, Heat a skillet over medium high heat and lay tortilla directly onto the pan. Using tongs to flip the tortilla every 15-30 seconds until crisped to desired doneness. 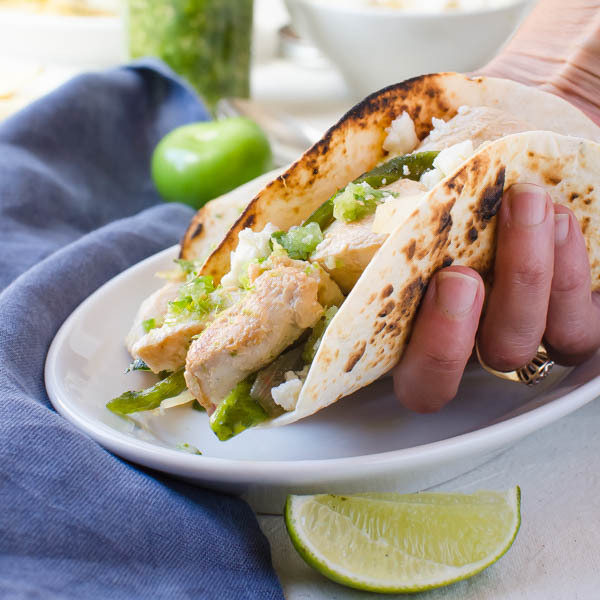 To serve: Place a few strips of chicken in a tortilla. Top with onions and poblano peppers, tomatillo salsa, tomato salsa, queso fresco, cilantro leaves and a squeeze of lime. These are PERFECT! I love everything about it. From the poblano peppers, tomatillo salsa, soft flour tortillas and the chicken. I want to have your lovely tacos tonight for dinner!! Beautiful photos as usual Lisa, and awesome recipe! You are too kind, Elaine! But you’re right, these tacos are PERFECT! Hope you enjoy! you had me at fresh tomatillo salsa! these tacos look amazing! I love Rick Bayless. Even been to one of his restaurants. This salsa looks absolutely amazing! I love Rick Bayless too — he’s so down to earth, friendly and extremely knowledgeable and talented. Humble too — and have you seen his yoga routine? Ah-mazing! This looks amazing, as usual, and so much better than an old date night! 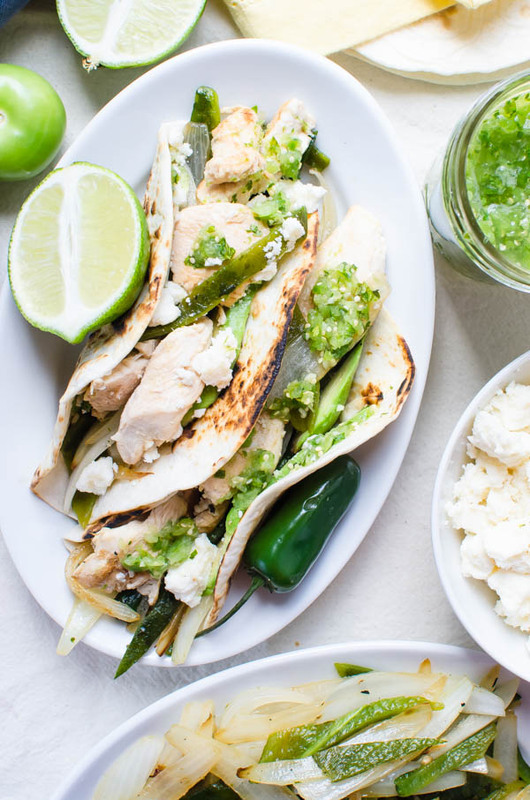 Tomatillo salsa is one of my all time favorite condiments, so I would be all over these tacos! I love your story, too. I often enjoy a date at home, cooking up something together in the kitchen, to going out. So cozy and fun. I have at least 3 versions of tomatillo salsa that I make regularly!